(b) The selection panel will be expected to exercise the highest degree of transparency and accountability, as stipulated in the Public Officers Ethics Act, and TSC Code of Conduct and Ethics 2015. The Head of Institution is required to induct the panel members on the relevant sections of the Act before the commencement of the selection exercise. 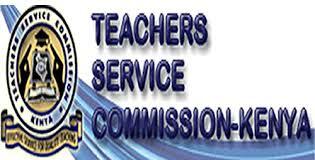 (c) All applicants must be registered teachers as per section 231) of the Teachers Service Commission Act, 2012. 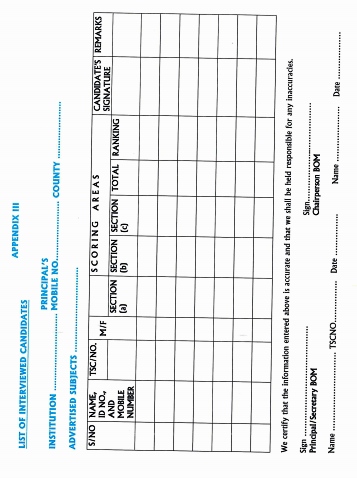 Those without Registration Certificates must attach a printout of the application form/payment receipt as evidence of application for registration. However, successful candidates who fail to meet registration requirements will not be recruited. (d) Applicants who apply for confirmation of results from KNEC should give the address of the County Director where they have submitted their application. (g) Heads of Institutions MUST acknowledge al applications upon receipt and, on completion of the selection process, promptly advise those who do not meet the criteria (specifying the reasons). (h) The TSC Sub-County Director shall compile a list of a applicants in every institution for ease of reference and present it during the interview. (i) The date, venue and time of the interview should be displayed on notice boards at the County, Sub-Counties, Zonal and Institutional offices. j) Heads of institutions should communicate to all applicants through SMS (short message service) 7 days before the actual date of interview. This provision MUST be strictly observed to ensure that all applicants are notified of the interview date, venue and time. i) Quality of certificates presented, KCSE, KCE; Higher aggregate KCSE/KCE grade should first be considered. If the candidates tie at the aggregate grade the subject grades should be used. iv) The names of interviewed candidates ranked in order of performance during the selection process for each vacancy (appendix i w then be submitted to the Commission. 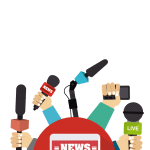 Provisional transcripts shall not be accepted Where names on the submitted documents differ, the applicant will be required to submit a sworn affidavit. (i). 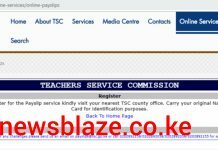 He/she meets the requirements of the TSC advertisement. (ii). All the submitted original academic and professional certificates, as well as official transcripts are authentic. The Secretary, Board of Management should certify photocopies of the certificates and authenticate the information provided to the TSC County Director. NB: The onus is on the concerned teacher to follow up with KNEC for the confirmation of results within 14 days after the interview date. c) Once the interview process is completed, the results must be communicated to the applicants the same day and the successful candidate(s), from the merit list, issued with the TSC Application for Employment Form. i. Exercise is fair and transparent. ii. Successful applicant (s) on the merit list fill the Application for Employment form. 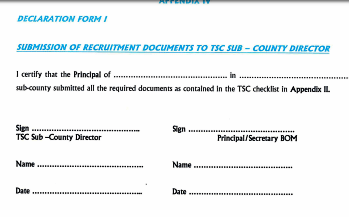 f) The completed form(s) together with the other relevant documents should be submitted to the TSC County Director’s office. 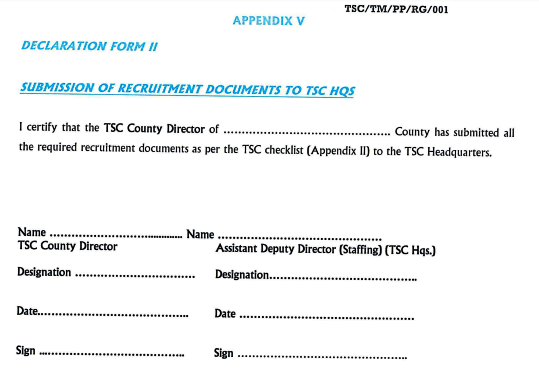 The TSC County Director, upon verification and ensuring that a the requirements are fulfilled, will submit the recruitment documents to the TSC Headquarters within the stipulated timeline. a). The Secretary Board of Management shall present a compiled list of all applicants to the selection panel. b)The selection panel shall harmonize the list of applicants with that of the TSC Sub- County Director and conduct interviews for those who meet the criteria. The County Director should note any inconsistency[ies), make decision(s) based on the guidelines and advise the Candidates/panel and the Commission accordingly. Applicants shall present themselves in person to the selection panel. 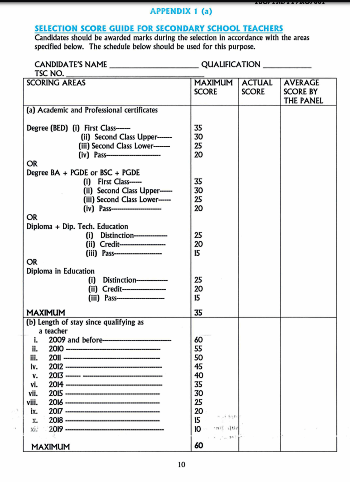 The panel shall score each candidate based on the selection score guide (appendix I (a) or l (b). a) A Bachelor of Education Degree with two (2) teaching subjects. Education(PGDE) with two teaching subjects. c). Bachelor of Science with EducationBachelor of Arts with Education with two teaching subjects. (i) Bachelor of Education holders with a mean grade of C Plain and C Plain in the two teaching subjects at KCSE and have undertaken a Diploma i Education or gone through the A level system in the relevant area(s) are eligible. (ii) Bridging /Pre-university certificates for those who completed the bridging course before December 31St 2015 can be considered. Applicants must have a minimum mean grade of C+ (plus) at KCSE or its equivalent with at least C+(plus) (or credit pass) in the two teaching subjects or one (I) principle and two (2) subsidiaries at ‘A’ level. In addition, they must have a Diploma in Education from a recognized teacher training Institution. NB: Diploma Teachers who graduated on or before 2008 with a mean grade of C (plain) and C (plain) in the two teaching subjects are eligible. considered as teaching subjects e.g. Biology/KSL, Geography/Braille. 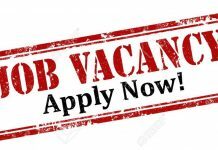 2) Applicants with Economics/Commerce/Accounting, Social Education and Ethics (SEE) can apply for Business Studies and CRE/IRE vacancies respectively. 3)Diploma Teachers with English/other subject qualify for employment as English/Literature teachers. 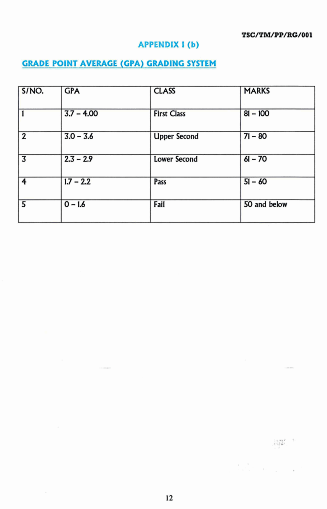 course units in each teaching subject. (i) Candidates presenting enhancement certificate(s)/official transcripts in a teaching subject(s) from recognized institution (s) qualify for employment. (iv) Applicants applying for computer studies MUST have taken a course on teaching methods. i. Ensure that the employment forms have all the attachments required. iii. Ensure the Principal has signed section C of the employment form confirming the candidate qualifies/merits to be employed. iv. Compile any complaints received and submit report on appropriate action taken or recommendations to the Commission. 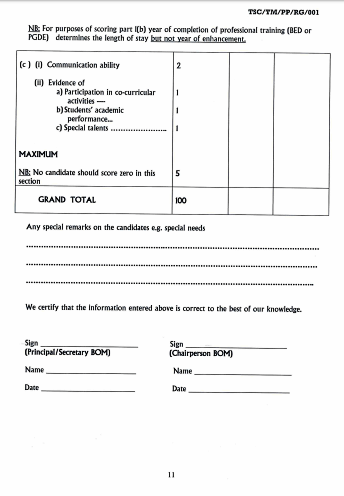 (a) Duly filled application form(s) for employment together with a copy of the acknowledgement of receipt of application for employment, certified copies of academic certificates, professional certificates and all official transcripts, identity card and two passport size photographs in respect of successful candidate(s). 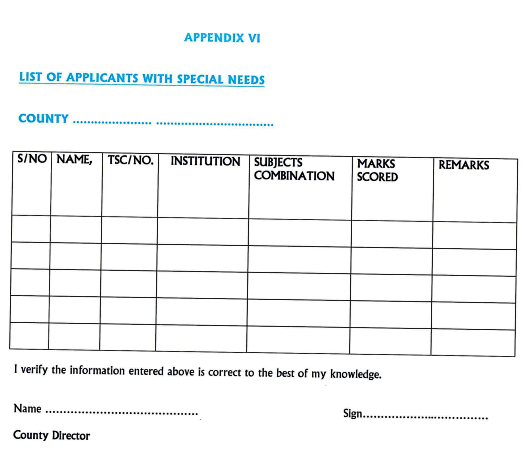 (b) A list of all applicants in order of merit for the advertised vacancies in Appendix (II (clearly mark the candidates who failed to attend the interview). (c) Duly signed minutes of the Board of Management. 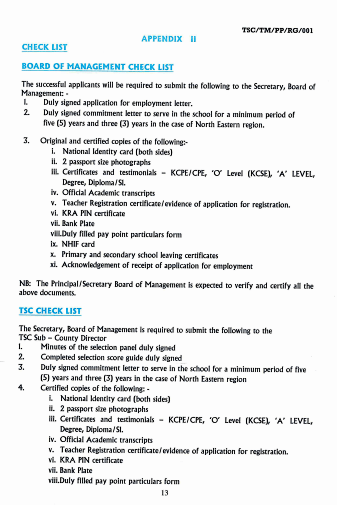 (f) Copy of teacher registration certificate/evidence of application for registration. (k) List of applicants who are Persons with Disabilities (PWD). 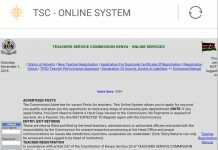 a) Any candidate who is dissatisfied with the process can make a complaint in writing to the TSC County Director not later than seven (7) days after the selection process and send a copy to the TSC Headquarters. b The TSC County Director should within 7 days address all complaints raised after the selection process has been completed and thereafter inform the headquarters on the action taken. a) Under no circumstances shall the Application for Employment form be defaced or photocopied for use. c) Whereas the Commission has delegated its teacher recruitment function, pursuant to Section 20 of the TSC Act, t shall continue exercising this mandate directly as stipulated under Article 237 of the Constitution. 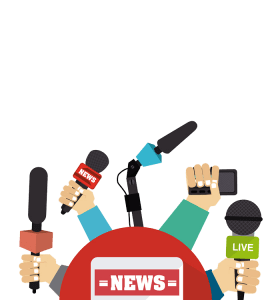 Appendix III: List of interviewed candidates. v. Teacher Registration certificate/evidence of application for registration. Next articleMinistry of Education to take stock of all ICT equipment at schools. Kcse c plain. Diploma in education 2013 and a BED 2018. Which one determines lenghty of stay?